Saturday 8 March is International Women’s Day, when people around the globe will come together to celebrate the economic, political and social achievements of women. Here at the Knowledge Exchange, we thought we would celebrate in the way we know best – by rounding up some of the most important recent research on gender equality issues. Earlier in the week, PricewaterhouseCoopers launched their latest Women in Work Index – a measure of five key indicators of female economic empowerment, based on data from 2012. It placed the UK 18th out of 27 OECD countries, noting that while some progress had been made, the UK was still behind many other OECD countries, particularly Nordic countries. In particular, the UK had among the lowest rates of women in full-time employment. Grant Thornton also published research this week which examined the gender gap in employment, focusing in particular on the proportion of senior management roles held by women. It found that on average in 2013, 24% of senior management roles across the world were filled by women, which continued an upward trend since 2010. In China, 51% of senior management positions were held by women, demonstrating that equality is indeed an attainable goal. However, it would seem the UK still has some way to go towards achieving this – it was placed among the bottom ten countries, with only 19% of senior management roles being held by women. Even for those women who do hold managerial or other senior management positions in the UK, there are significant sectoral disparities, as illustrated by Labour Market Survey data, highlighted in a recent House of Commons Library Standard Note. For example, in Q2 2013, women were poorly represented at the most senior levels of chief executives and senior officials (31.3%), yet comprised the majority of managers and directors in health and social services (66.3%). The gender gap in science, technology, engineering and mathematics (STEM) occupations is a particular area of concern, and was a recent topic of a report by the House of Commons Science and Technology Committee. They reported that, in 2012, only 13% of all STEM jobs in the UK were held by women. So there is clearly much work still to be done to promote women’s equality within the workplace. But where to start? The general consensus found by Grant Thornton was that “change begins with education”, citing research which found links between higher education levels and increased female labour market participation. A similar relationship was also reported by a recent Institute for Public Policy Research (IPPR) report, which noted that maternal employment rates rose substantially with educational attainment. In schools, the House of Commons Science and Technology Committee concluded that providing young women with improved careers information, advice and guidance about occupations traditionally dominated by men is crucial to tackle gender divisions across employment sectors. And within the workplace, Grant Thornton found that effective talent management was a key factor in the promotion of women. They suggest that employers need to find ways to better support women, and highlight the potential of flexible working among other approaches, such as internships, apprenticeships and tailored career paths. Women also need to be supported outside of the workplace, as recent research into the costs and availability of childcare has shown. 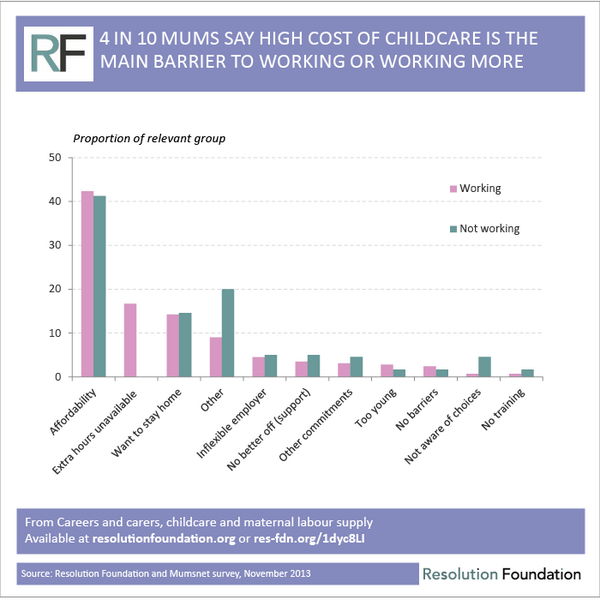 Recent research by the Resolution Foundation, found that four in ten mothers felt that high childcare costs were the main barrier to them entering employment or working more hours. The IPPR also found considerable evidence of a relationship between the greater availability of affordable childcare and increased maternal employment rates, both in terms of the numbers of mothers working and the hours they work. The government has also taken steps to promote women’s equality within the workplace, and in November 2013 published an action plan, which includes the introduction of shared parental leave, extending the right to request flexible working to all employees, increasing child tax credits for lower income families, and extending the free entitlement to early education. So, in light of such research findings, expert recommendations and forthcoming policy changes, it is hoped that this time next year, the UK will have made even greater progress towards equality for women. This entry was posted in Equality and Diversity and tagged gender equality, Grant Thornton, international womens day, iwd2014, women, women in business, womens day. Bookmark the permalink.